LFC Foundation Kicks Football is coming to Kirkby! 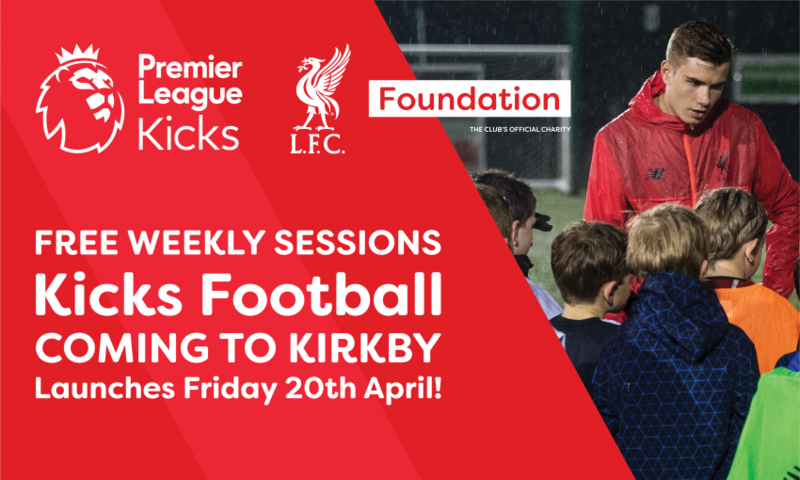 The LFC Foundation Kicks Football Sessions will launch on Friday April 20th in Kirkby! Girls and boys aged between 8 - 17 can attend free weekly football sessions at Kirkby Leisure Centre, coached by the LFC Foundation team. From 5-6pm, 8 to 13 year olds are welcome, whilst 6-7pm caters for the older youngsters aged 14 to 17. Both sessions require no pre-sign up - just turn up on the day and play! Supported by Merseyside Fire and Rescue Service and Knowsley Council, the LFC Foundation's excellent Premier League Kicks Football Programme has now expanded to Knowsley. Currently, we coach sessions in 13 areas across the city region including; Anfield, Toxteth, Walton, Croxteth and Speke. This is the LFC Foundation's first provision of a Kicks programme in Knowsley. Over the years, our free-to-attend Premier League Kicks sessions ran by LFC Foundation, FA Qualified coaches have engaged over 10,000 individuals, utilising the power of the LFC Crest to increase sports participation and improve the health and wellbeing of children in our community. With over 100 participants playing every week, the LFC Foundation Kicks programme is one of the highest performing football coaching setups in the country for girls and boys, ensuring our duty in providing the need for sports activation within our community.